Win FREE Tickets to Batman: The Killing Joke! Alan Moore and Brian Bolland’s Batman: The Killing Joke is an iconic story in the history of Batman comics. The graphic novel was published in 1988, but it made the New York Times bestsellers list as recently as 2009 and has influenced almost three decades of writing and film, especially when it comes to the Joker. Now this story is coming to the screen in the form of a full-length animated film—featuring Kevin Conroy as Batman and Mark Hamill as the Joker, reprising the roles they voiced in Batman: The Animated Series and many other animated films, TV series, and video games. It will premiere at San Diego Comic-Con this week before being released digitally July 26 and on Blu-ray August 2. But in between, it will be coming to theaters for one night only—next Monday, July 25—and we’re giving away three pairs of tickets for you to see it! Entries will be accepted until 2:00 p.m. Central time on Friday, July 22, 2016. We’ll randomly pick THREE WINNERS who will each receive TWO TICKETS to see Batman: The Killing Joke at 7:30 on Monday, July 25, at the AMC theater in Roseville. Note: This is not the only showing at Rosedale, and Rosedale isn’t the only theater in Minnesota showing the film. 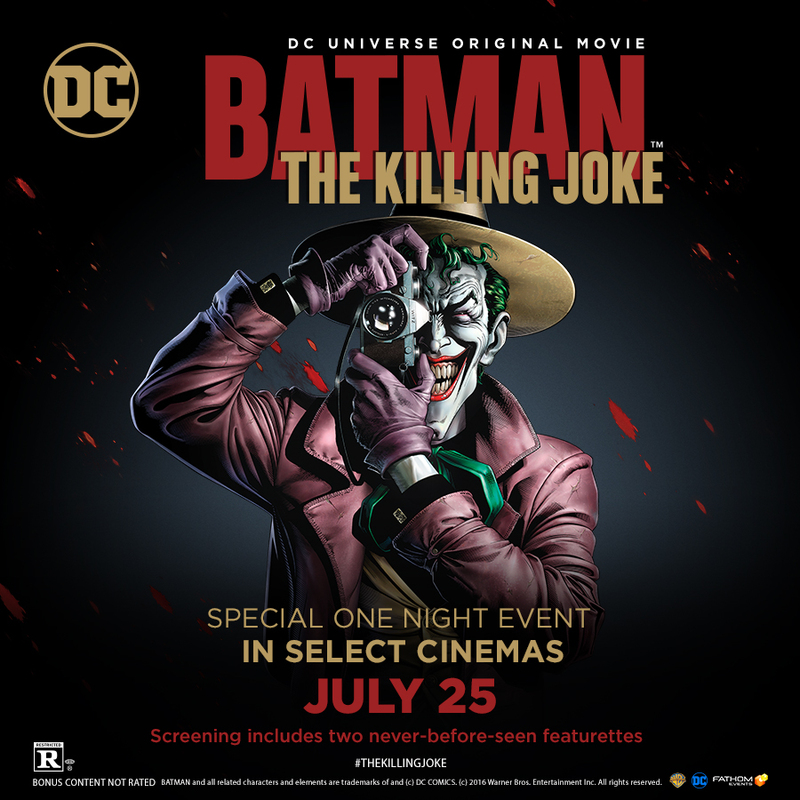 For a full list of theaters hosting this event, or to purchase tickets in case you aren’t chosen as one of our winners, click here to visit the Fathom Events page for The Killing Joke. No purchase necessary. Tickets will be provided for all winners by email via Fathom Events. Any expenses incurred as a result of winning this prize, including taxes, are the sole responsibility of the winner. Total number of prizes to be given away is 3. Each prize consists of 2 tickets (retail value $26.78). How to Enter: Follow @TwinCitiesGeeks on Twitter and tweet out your favorite actor to play the Joker, including @TwinCitiesGeek and #BatmanTheKillingJoke in your tweet. Only one entry per Twitter account will be counted. Selection and Notification of Winner: Each eligible entry will be assigned a number in ascending order based on the order in which the comments were made. A number will then be chosen by means of a random number generator, and the user who posted the tweet corresponding to that number will be deemed the winner. Odds of winning are dependent on the number of entries received. Eligibility: Giveaway is open only to legal residents of Minnesota who are 18 years of age or older at time of entry. Void where prohibited by law. In order for an entry to be counted, the tweet must be sent by 2:00 p.m. Central time on July 22, 2016; it must tag the account @TwinCitiesGeeks and include the hashtag #BatmanTheKillingJoke; and the account that sent the tweet must be following @TwinCitiesGeeks. Current Twin Cities Geek contributors and editors are not eligible for entry.